NextGen Player: A lot of gamers have been asking us when the used game program will be rolled out completely across the Greater Toronto Area (GTA), any idea when this will happen? NGP: Are there more locations across Canada that currently do not sell used games where we might see the program roll-out? Brian: Used gaming at Future Shop has launched nationally across 120 retail locations out of 139. Our intention is to launch in all markets legally possible. 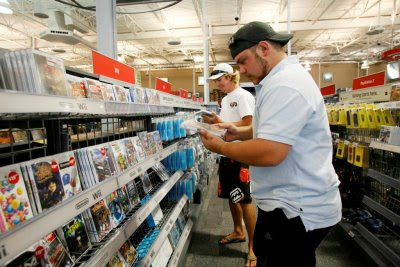 NGP: What's the best way for gamers to stay abreast of the latest Future Shop used gaming news and deals? Brian: The best resources for anyone to stay on top of all the latest used gaming news, is checking Future Shop’s store flyers and our website, specifically www.futureshop.ca/usedgames. It’s worth noting that Future Shop now sells used games online at www.futureshop.ca. NGP: Are there any key differentiators/advantages between the Future Shop used game program and other programs on the market that you'd like our readers to know about? Brian: Future Shop has a number of key advantages for used gaming customers. First, Future Shop’s used gaming program offers choice. Customers can turn your old games into a cell phone, digital camera, ipod or even new a video game – the choice is theirs. Lastly, I’d say its peace of mind through Future Shop Used Games Guarantee. There’s a 30-day guarantee on all used games. Used games are inspected quality assurance. If there’s a problem, we’ll exchange it for the same game or provide an in-store credit. See one of our associates in-store for details. NGP: Thanks Brian for your time, and good luck with the program. As Future Shop's used game business continues to grow, it will be interesting to see how it will affect the used game market. I see a positive shift for the consumer in the form of more competitive offerings and greater choice and flexibility. I tend to be in the camp that thinks greater competition can only benefit the consumer. The part of the interview that really interested me was when Brian mentioned the trade-in credit can be put towards all Future Shop departments such as cameras, ipods, or cell phones. Having that kind of flexibility is certainly appealing.